We believe that Hair Extensions are a separate sub-division of the hair industry and understanding its dynamics take dedication, time and intention. This is why at Hair Boss Salon we train an elite team of professionals to specialize in all your personalized hair extension services. We not only provide innovative extension techniques, we offer a full service salon including coloring, cutting, blowouts, hair styling and more! The “Blow Out” is a staple service that you will find in every salon! What makes ours so special?! We believe that every time you wash your hair you should be providing a dose of vital nutrients that your hair needs to thrive! We are equipped with a Shampoo bar of high end salon grade ingredients and treatments that your hair is thirsty for! Your hair stylist is a hair alchemists that will concoct the perfect remedy for what your hair needs by giving it an essential dose vitamins that will provide nourishment and hydration. 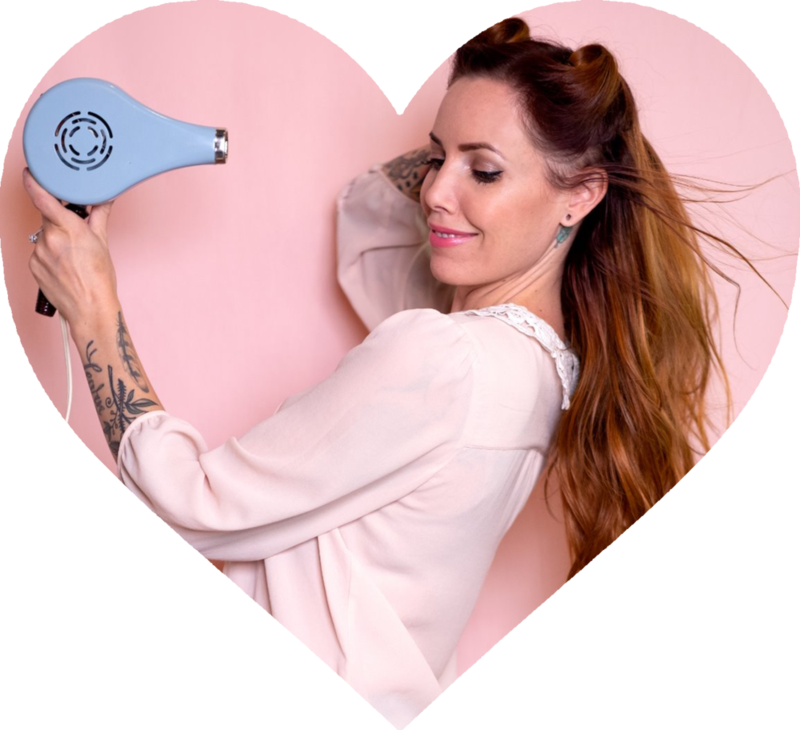 Each Blow Out service boosts your hair with love & botanicals to reenergize and restore your hairs vibrancy! Menu prices are subject to being less or more on a case by case basis. For a price tailored to your specific needs we request you to book a complimentary consultation. All colour, tone, and treatment services start with the cost of a Blow Out. Any additional service is an “add on”. What does High-end imply? It means that all the products we work with are the best on the market using the highest possible ingredients to preserve the quality of your hair. We have hand picked our favourite products that use the latest and greatest in technology that the hair industry has to offer. We have a large selection of ammonia free colour, as well as the most innovative lightening systems to lift levels while protecting your strands. We use oil base bleaching systems because they are the most nourishing on the hair, and all of our bleaching services come with a built in bond protecting treatment. We believe this is the only way to safely lighten the hair and we only want to give you the best! *A consultation is required before booking a hair extension installation. Consultations are complimentary and include a 30 minute appointment to meet with one of our experts to discuss your hair goals, our signature technique, and give you a price tailored to your specific needs. A consultation is needed in order to give an accurate price quote. Costs vary based on your personalized details such as type of hair you match with, length, amount needed, colour and any necessary customization needed. We are not able to give price quotes without first having a consultation. If you are not local to our salon, we do offer video consultations! If it is your first time visiting us for a colour or hair extension service, we welcome you to book a complimentary consultation with one of our specialists to discuss your desired results and obtain a price quote tailored to your specific needs. Below is the most popular packages but are not limited to these specifications. We offer a wide rage of lengths and various hair types. Best suited for those wanting to add thickness to fine hair. Best suited for 14- 16", or for adding volume to already long hair. Most popular package for 20" to obtain length, volume and layers. Best suited for 22", or for those desiring mega volume or heavy layers. Recommended for lengths 22" and longer, for achieving maximum fullness for desired longer lengths. We specialize in Customization! Experience having your new hair tailored to your personal Style! From Shadow Roots, Balayage, Highlights/Lowlights, and Fashion colors, we are equipped with a Full-Service Salon and trained Colourists to accomplish the job! We show you the different hair wefts options! We offer Machine Weft, Hybrid Weft, Hand Tied Weft and Clip in’s! We game plan any weft color customization! We specialize in tailoring your extensions to your hair’s color tones. We discuss our package pricing, and how bundling can save you money! Clearly discuss all of our booking policies and give you a cost tailored to your specific needs! Find an appointment time, order your hair if it’s not in stock, and book you in! That's right ladies, you can bring your own bundle of hair and have us install it for you! The BYOB service does requires a consultation so one of our experts can ensure we have the recommended amount of hair and a quality we can stand behind. We will always use our best judgment and expertise to make sure that you leave with results beyond your expectations! LONGER, THICKER HAIR INSTANTLY! FOR EVERY OCCASION AT YOUR CONVENIENCE! A CLIP IN CUSTOMIZATION SERVICE For a seamless blend every time you clip them in! Step 1. Choose from one of our Hair Boss Clip In Signature Collections or bring in your own! Step 3. We give you a mini tutorial on how to best place and install your hair extensions according to balance and even distribution. Step 4. Cut to blend in with your own natural hair. Relax and let us personalize your clip in extensions custom to fit your look! Step 5. We mark your clips so you always know which ones go where. Step 6. We make a customize head chart just for you according to your personalized placement. Step 7. We will custom cut your extensions so that they blend in perfectly with your own hair every time you wear them. Step 9. We do a mini photo shoot and introduce the new you! We require a 50% non-refundable deposit when booking a colour or hair extension appointment. Being on time for your appointment is important as we often book back to back. If you are 15 min late to your appointment you may be subject to missing your appointment and last minute cancellation fee's will apply. We adhere to a strict cancellation policy and require a 48 hour notice when cancelling or rescheduling your colour or extension appointment. Cancelling within 25-48 hours subjects you to a $50 late fee. Cancellations under 24 hours are subject to a $100 fee for the reserved time. We recommend to come in with clean, straight hair prior to your hair extension installation unless booking a Wash + Blowout prior to your appointment.